Some more model assembly for Chaos, this time a big pack of renegades. Looking through boxes, I found a bunch of assembled BP/CCW space marines (and two with meltas) so those formed the core of the unit. A pile of parts and some glue later and seven more with a more obviously chaotic look joined them, along with a champion that used to be the Emperor's. The more recent renegades. 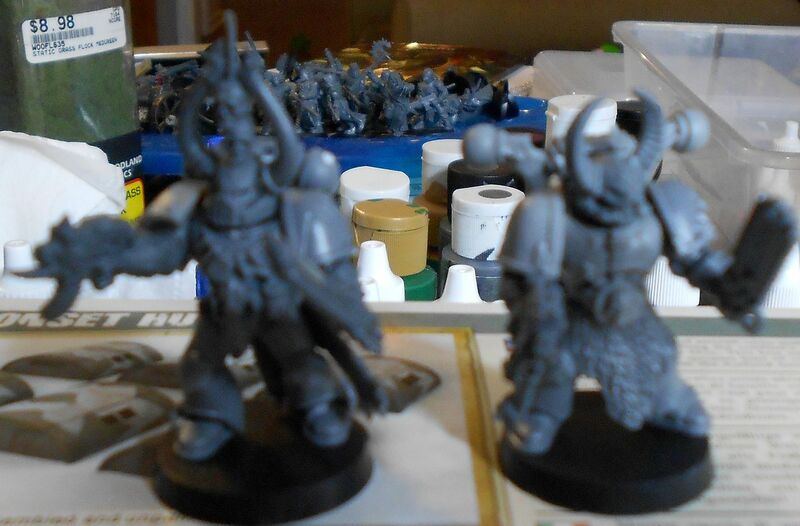 I think that these may even be some of the remainder from a giant batch of Space Wolf stuff I got off of ebay ages ago that were originally intended as blood claws. Champion and two other renegades. Oops, blurry pic of the last two. I plan to paint up all of the renegades differently, a bunch of solo traitors that have banded (or been thrown) together. I also built twenty more cultists, the autogun-packing version. Just straight builds. I like the premiss that they're renegades from various sources and not the typical fallen chapter, company, whatever. Good work on the modeling so far. Thanks. There are certainly more uniform units within the Endless Ones, but I want these guys to be very hodge-podge.